Football Combination (Wet or Dry) - Inflatable Rental This football them combination bounce house features a 13x13 bounce area, climbing wall, slide and basketball goal. The unit can be rented wet or dry. When rented wet, water sprays from atop the slide and collects in a splash zone at the bottom of the slide. 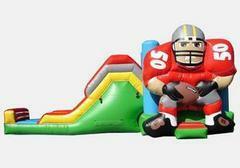 This combination football bounce house is fun for all ages and is bigger than life in person.